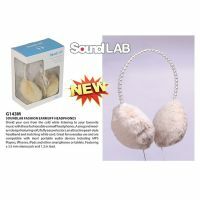 These earmuff headphones are great for everyday use and are compatible with most portable audio devices including MP3 Players, iPhones, iPads and other smartphones or tablets. Featuring a 3.5mm stereo jack and 1.2m lead. Shield your ears from the cold while listening to your favourite music with these fashionable earmuff headphones. A snug and modern design featuring soft, fluffy ear protectors, an attractive pearl style headband and matching white cord.